Trace – If successful, give the Runner 1 tag. The impact of this card comes from its combination with Scorched Earth. The SEA, Scorched, Scorched combo is well known as one of the primary ways of flatlining the runner with meat damage. 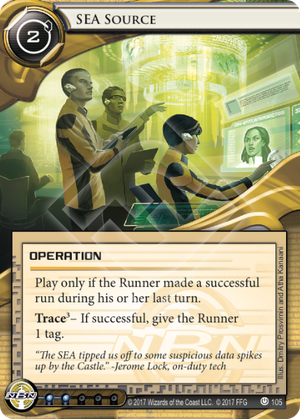 It is a fact that new players should realize - If the runner run and ends the turn with more than a six credit difference (adjusted by link) under the corp, then they can very well be flatlined without other protection. (2 for Sea Source, Runners-2 to win the trace, 3+3 for two Scorched Earths) Money is a way to keep that safe, staying above the six credit limit when making a run is a form of protection. If the runner does not run, they cannot be hit with cards that tag, outside of a Data Raven counter. That is the limit of this card, but otherwise it is a very powerful way to land a tag when it is needed. The runner has to run, and because always keeping the runner out of servers and successful runs is impossible, SEA Source will be viable to land that tag. It will remain a strong card for that fact.